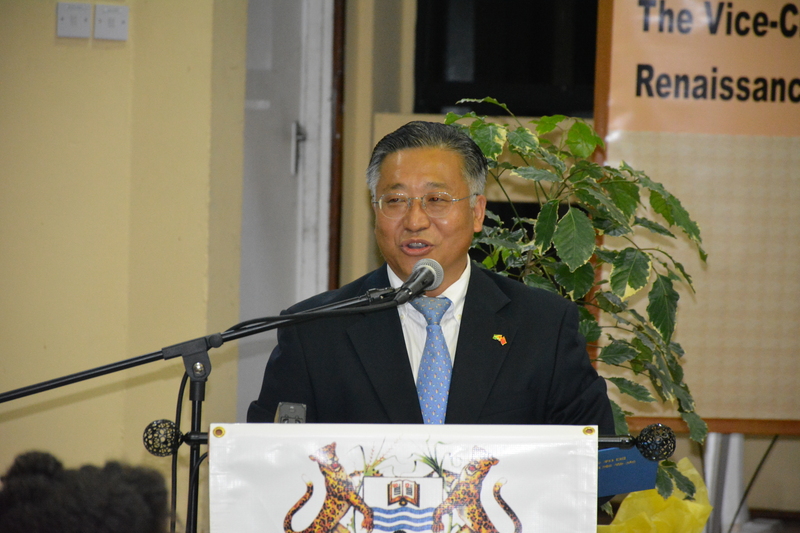 Chinese Ambassador to Guyana, Cui Jianchu said his country stands ready to aid the infrastructural development of Guyana in light of the expected oil and gas boom, adding that in order for a country to develop, the necessary infrastructure needs to be put in place. The Ambassador made the statement while delivering the Vice Chancellor’s Seventh Renaissance Lecture on Monday at the University of Guyana’s Turkeyen Campus. He told the gathering of students, lecturers and members of civil society that the Chinese businesses are willing to invest in Guyana’s development and that the Private Sector should play a much more integral role in the country’s development. He added too that Guyana is on China’s list for aid and as part of his Government’s strategy of extending diplomatic relations, the idea of President David Granger’s dream of realising a paved highway from Linden to Lethem would be realised. “In China we have a thing that if you want to get rich then you have to build your road. There is the opportunity in Guyana for China and Guyana because we not only have the experience, we have the human power and we think the two countries can work together,” he noted. “The President told me how can we build the road from Lethem to Linden and I told my colleagues we have to spend time to go there and to drive there. We think that if we develop Guyana, we know you have gas and oil by 2020 but we think we could have the opportunity to invest more resources in infrastructure and I think that is a good move,” the diplomat added. He further stated that he is committed to working with the Guyanese businesses and Government to realise the infrastructure potentials, making specific reference to the current expansion project at the Cheddi Jagan International Airport (CJIA) being executed by China Harbour Engineering. “I am ready to work with the Guyanese business people, the Government to make the infrastructure. To try to make the infrastructure first eye, the vision into action and to make reality. The Cheddi Jagan Airport is done by Chinese Harbour and it is expected to be finished by year end and it is really important step. We also want to see how can we have deep harbour, how can we have the highway because in China we have suffered a lot… without infrastructure we cannot support development in the country,” Jianchung related. He added that they are aggressively working with the Government to implement the “Jainchung Initiative” or the 5 IT strategy that focuses on: Infrastructure, Information Communication Technology (ICT), Investment, Industry and Integration in addition to Talks, Talent, Technology, Trade and Tourism. He said the initiative is consistent with Guyana’s green agenda as well as its overall development policy and it can form the basis for increased investment and trade between Guyana and China. “Integration – this is one of the hardest for us because not a lot of Chinese know about Guyana and those here are recognised as one of the nations. We have them in every field and we are working to have them integrated in the Guyanese society,” he highlighted. The ambassador said as a part of facilitating development in developing nations, the Chinese Government started the One Belt One Road Initiative (OBORI) or simply called the Silk Road Economic Belt. The OBORI aims to connect the disparate regions in China’s near and distant neighbourhood through a massive programme of infrastructure building and is expected to cost some $100 trillion with over four per cent of that amount already being invested.